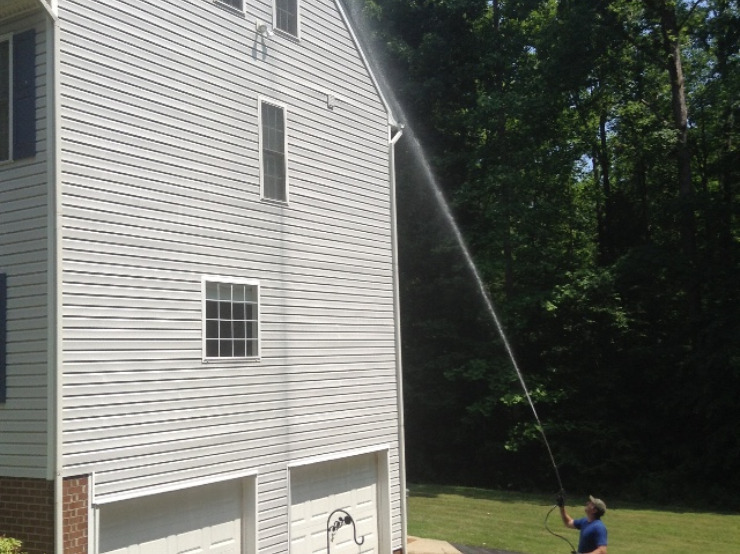 Our pressure washing in Chesterfield VA, uses a commercial grade, bleach-based house washing detergent to remove mold, mildew, algae, dirt, debris, spider webs, bird and bug mess, followed with our Simoniz rinsing agent for a virtually spot free rinse. Our house washing, including a high-pressure cleaning of the foundation and brick stoops and followed with Simoniz Prime rinsing agent. Our house washing, including a tool shed, a high-pressure cleaning of the foundation, brick stoops, and front walkway, and followed with Simoniz Prime rinsing agent. We use a commercial grade, bleach based, house washing detergent to remove mold, mildew, algae, dirt, debris, spider webs, bird and bug mess, from your siding, foundation, brick stoops, tool shed, front walkway, ground gutters, concrete trim, and followed with our Simoniz Prime PAK rinsing agent, then rinsing your driveway to remove leaves and loose debris. After pressure washing your home, debris trapped in cracks and crevices may drip out; sometimes days later. With our detailing services we return to your property 3 to 5 business days after everything has completely dried to hand wipe these areas, brush the entire foundation where dripping water has splashed dirt back on, and spot clean areas of rust. Pressured Cleaned with a high alkaline solution to restore your decks natural color, removing mold, mildew, dirt, debris, and some to most old failing sealants and stains. After the pressure washing is complete, we apply a brightener/neutralizer as recommended by most sealant and stain manufacturers. Please call for an estimate if you require the complete removal of a paint or stain. Now with 3 different products used to virtually eliminate spots from tap water. With "Prime" offering better water breakage and beading, and "Prime PAK" offering the best. Most of our customers find that professional window cleaning is not required afterward; however, if you are particular about your windows we would recommend you still use them. Its other more important benefit, is to repel water from your siding from rain or dew, to slow the growth of mildew and algae. COMPLETELY INVISIBLE TO THE NAKED EYE. Cleaned by the same process as vinyl siding and wood decks.